At least once a month, I get a craving for Snack’s artichoke chicken salad. A big bowl of potatoes, butter beans, tomatoes, string beans and chicken are tossed with black olive vinaigrette. 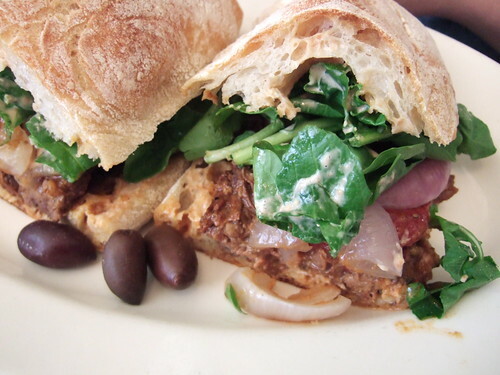 If I’m in the mood for braised lamb without the heavy sauce, I order their braised lamb sandwich with tomatoes and roasted red onions with tomato aioli and arugula on ciabata bread. The bulgur wheat salad is also delicious with mint and walnuts in citrus vinaigrette. I’ve had better houmus and pita bread elsewhere but I doubt any other Greek restaurant, Queens included, can beat their spanakopitakia or spinach triangles. The phyllo flakes off ever-so-lightly at each bite. For dinner hours, the menu changes to include heftier items. When I visit, I always order the white anchovies and the octopus as appetizers. For main courses, I’ve enjoyed their vegetarian mousaka with eggplants, mushrooms and potatoes in creamy bechamel sauce. The braised lamb stifado smells really nice with currants and apricots while the keftedakia or veal meatballs are a treat with pine nuts. Snack’s menu rarely changes, but with meals that are sure to please, I don’t see a reason why it should.